FROM MUSHROOM HUNTING TO URBAN FORAGING. 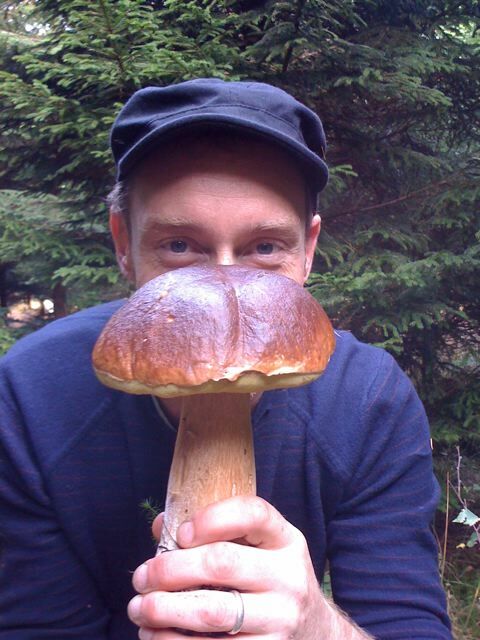 John Rensten (that’s me) lived and worked and foraged in London for 20 years before finally escaping to Dorset, via Hampshire, in 2016 to concentrate on my mushroom hunting and coastal foraging. Despite now living in a more rural part of the county, I still run and organise numerous urban foraging events, wild food walks and mushroom forays, some hosted by myself and some other very wonderful and extremely knowledgable people that I have “collected” along the way. In 2004, with a good friend, I opened a successful gastro pub, The Green, in Clerkenwell EC1 and soon found that I could combine my love of foraging wild food with my enthusiasm for running a busy eatery. Actually it was the perfect excuse to get me away from the hectic side of the business and get some more peaceful time in the woods foraging for wild mushrooms or by the coast collecting seaweeds and wild plants. We started to add various foraged foods to the menu. Initially I picked lots of delicious wild edible mushrooms, my hobby for a few years previously, also plants like wild garlic and sorrel that I gathered each Easter in Devon and our chef used to make wild garlic mash or garlic and sorrel soup. Sea-beet from Dorset was always popular too and soon we had the menu dotted with wild foraged treats, wild fennel, rose hips, elderberries, samphire, borage, mallow and various seaweeds. I’ve set up Forage London to give city dwellers like myself a chance to enjoy and discover some of the amazing wild foods that grow all around us. I hope you enjoy this site and that you come on one of my walks soon. So, while you’re here….You might like to read the introduction to my book, The Edible City – a year of wild food, which explains a lot of the reasons that I became obsessed and why I think that now, more than ever, this is a very relevant activity for anyone living in a city. of sourcing wild ingredients from outside the city to add to the menu. far closer to home and turned my focus onto the place in which I lived. are already cooking and eating. incorporating into some wild spring rolls or sushi. find myself smiling rather a lot. memorize hundreds of Latin names and complicated plant diagrams. identify, common as you like, ‘weed’. wonder, an ongoing education and a provider of almost daily inspiration. available, not to hanker after what is not. the globe, taking in countries as diverse as North America and Japan. other ways in which it provides for the local and wider community. of them giving me multiple crops spread out across the year. and tastiest, but I reference many, many more. The plants themselves fall into two, totally non-botanical groups. natural diversity, as fertile and bountiful as anywhere else in the country. brim with sweet smells, strong flavours and bright colours. consume are, to most of us, very mysterious. onto my soap box . . . much. presentation are really all they need. strategy is to make a small amount of knowledge yield a big reward. seasons and how these affect what is, and what isn’t, available. spotting a good friend a hundred feet away in a crowd of people. we are actually surrounded by it: tasty, healthy and hiding in plain sight. it’s fun and it’s absolutely delicious.